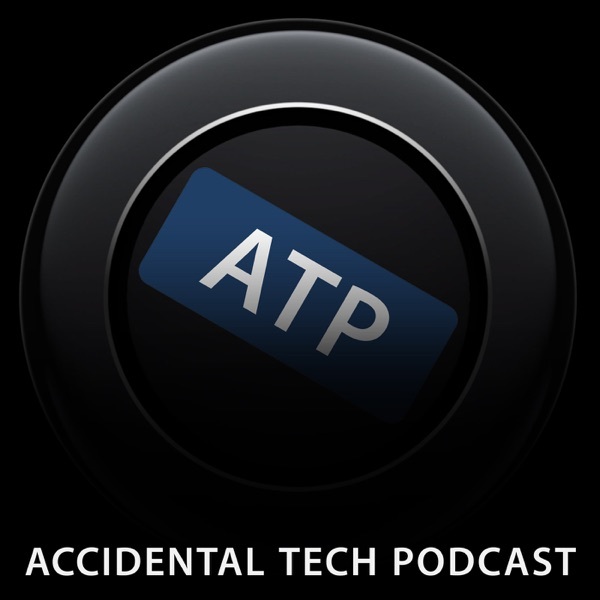 Accidental Tech Podcast | Listen Free on Castbox. Pre-show: Casey and John file Overcast bugsFollow-up:More AirPower follow-up. (Really! )Netflix, AirPlay, and screen rightsAirPlay quality lossAirPod fidget spinnerOf course Katie Bouman should get the creditHow to Understand the Image of a Black HoleApple and Qualcomm settle and then Intel exits 5G businessApple press releaseJohn on patents 1, 2, 3iOS 13: Dark Mode, Volume HUD, multi-windows/"cards" on iPadPanelKitKai's Power ToolsUnified Find My iPhone & Find My FriendsTilemacOS 10.15 rumorsLuna DisplayAstropadSidecarMoomPost-show: Top Four ATP Hosts with Bad TasteSponsored by:Squarespace: Make your next move. Use code ATP for 10% off your first order.Jamf Now: Set up and protect your Apple devices at work, from anywhere. First 3 devices are free.Linode: Instantly deploy and manage an SSD server in the Linode Cloud. Use code atp2019 for a $20 credit. Pre-show:Casey's #snelltalk submissionJohn's appearance on UpgradeFollow-up:Last week's PowerByProxy-AirPower story is disputedGame of Thrones and modern televisionApple News on John's Mac is still brokenApple Cinema Display LEDNetflix No Longer Supports AirPlayClarification from NetflixDemotivators: MeetingsThe Great iTunes Break-UpThe Monkey's PawQuickTime 7SoundJam MPCardhopMusicKit#askatp:Is it bad to use high-wattage chargers even though the devices get warm? (via Sean Kelker)How do version numbers work? (via Aadi)Semantic VersioningHow do we keep code snippets for reference? (via Vincent Steinmann)FCModelFCUtilitiesCPANPost-show: Casey's Live Instagram ExperimentAlfa Romeo Stelvio QuadrifoglioAdobe Premiere RushSponsored by:Squarespace: Make your next move. Use code ATP for 10% off your first order.Linode: Instantly deploy and manage an SSD server in the Linode Cloud. Get a $20 credit with code atp2019.Eero: Finally, Wi-Fi that works. Get $100 off a Wi-Fi system and a year of eero Plus with code ATP. Follow-up:AirPods 2 hinge is differentiFixIt TeardownPeople use GSuite! Dozens of us!Workaround that uses Charles ProxyProbably a Google issue?AirPower cancelledStudio Neat Material DockGoogle StadiaPreviously on ATPOnLivePlaystation NowGeForce NowGoogle Public DNSKali#askatp:Have any tips on booking a Disney World vacation? (via Stephen Kim)David's Vacation Club Rentals50's Prime Time CaféDisney's Hollywood StudiosWizarding World of Harry PotterWhat do we use to post/share photos? (via Andrew Wade)Do we still check drive health? (via Jack Mordoj)Windows Disk DefragmenterPost-show: 100% plant-based follow-upMichael Pollan articleHow Not to DieIvor CumminsIndex fundCasey's app's business modelSponsored by:Away: Because this season, everyone wants to get Away. Get $20 off your suitcase with code ATP.Fracture: Photos printed in vivid color directly on glass. Get a special discount on your first order.Molekule: The only air purifier that actually destroys pollutants at a molecular level. ATP Live at WWDC 2019Tickets are $29 and go on sale Friday, March 29Hammer Theatre, Monday June 3, 6:00 PMFollow-up:"Pro" iPad MiniStudio Neat CanopyAMD vs. NVIDIAiMacs with spinning disksMarco and HDMI-CECJoe and Scott's tipIvan's tipJoanna Stern on the butterfly keyboardsCasey's Mail.app gets broken in 10.14.4MacRumors threadReview of the new AirPodsApple March 25 EventCraig Hockenberry & Iconfactory's PatreonApple News+Steve Troughton-SmithUIMenuControllerJoanna Stern on her recent articlce50% cut?List of MagazinesApple CardThread by Peter BergApple ArcadeJourneyApple TV appThe many flavors of "Apple TV"Gurman on non-tvOS Apple TVsApple TV ChannelsApple TV+Kumail NanjianiUpgradePost-show: Incorrectly slicing a bagelPanera BreadBruegger'sSponsored by:Hullo Pillow: Your favorite pillow, guaranteed.Backblaze: Online backup for $6/month. Native. Unlimited. Unthrottled. Uncomplicated.Linode: Instantly deploy and manage an SSD server in the Linode Cloud. Get a server running in seconds with your choice of Linux distro, resources, and node location. Follow-up:Hierarchy of Needs is satisfied... by a ThinkPad?Searching for things in Settings.appNvidia and AppleCUDAApple's wild and crazy weekMonday: New iPads!iPad Mini!! !iPad AirJessie Char's revised lineupTuesday: New iMacs!Upgrade #237: New iMacs, iPads, and the 2019 March Event DraftColleen NovielliConnected #235: Stephen's Hellish Nightmare of DatesiMac Pro bumpsWednesday: New AirPodsMarch 25th Apple event#askatp:Why doesn't Marco lease iPhones? (via Jacob Ford)Would Marco still recommend the 2015 MacBook Pro? (via David Mikucki)How is Overcast adoption of CarPlay vs. Apple Watch? (via Chris Adamson)Post-show: Marco's HDMI CEC updateReddit postSponsored by:Marine Layer: Clothes that make it easy to get dressed in the morning. Use code atp15 for 15% off your first order.Squarespace: Make your next move. Use code ATP for 10% off your first order.Linode: Instantly deploy and manage an SSD server in the Linode Cloud. Use code atp2019 for a $20 credit. A special extended WWDC segmentMacworld New York 1999Aston Martin DB4 GT ZagatoLamborghini MiuraMcLaren F1Jaguar XKSSBugatti Type 57 AtalantePorsche 550Live ATP "Save the Date": evening of June 3Apple and SpotifySpotify's website and videoApple's responseManton Reece's take#askatp:Is Perl dead? (via Gustavo Poscidonio)Can using AirPods in loud environments cause hearing damage?Post-show: Casey's rejiggered prioritiesAnalog(ue) #151: Super Simple? Thank You Very MuchYouTube channels:CaseyJohnMarcoSponsored by:Mack Weldon: Reinventing men’s basics with smart design, premium fabrics, and simple shopping. Get 20% off your first order with code ATP.Squarespace: Make your next move. Use code ATP for 10% off your first order.Audible: Get a free audiobook with a 30-day trial. Follow-up: Two-hand Springboard rearrangementAsk TogCreative Selection by Ken KociendaFinding 32-bit appsCorning is working on flexible glassStar Trek IV: The Voyage HomeThunderbolt 3 → USB4Microsoft's Xbox Game PassApple vs. NVIDIASystem Integrity ProtectionCUDA (not Cuda)End of configurable Macs?Gruber's $0.02MacBook Hierarchy of NeedsMaslow's Hierarchy of Needs#askatp:How much will John spend on a new Mac Pro? (via Matt Corkum)Are we really professional podcasters? (via Asajz)Post-show Neutral: Polestar 2 (via Vincent Skerved)Top Gear first lookConfiguratorSponsored by:Eero: Finally, Wi-Fi that works. Get $100 off a Wi-Fi system and a year of eero Plus with code ATP.Away: Because this season, everyone wants to get Away. Get $20 off a suitcase with code ATP.Hover: Find a domain name for your passion. Get 10% off your first purchase. Follow-up:16" laptopsBus-powered Thunderbolt 3 hubsElgatoCalDigitMonopriceStarTech (2 USB ports! But $183. )USB 3.2 standard namesFoldable phones from Samsung and HuaweiUpgrade #234: The Ideological Folding WarsHypercritical #86: Naked Robotic CoreA giant battery with a phone in itPanasonic ToughbookApple's Rumored March Event and gaming subscription serviceLisa Jackson#askatp:How do you purge many old apps at once? (via Mark Heeler)Does John still want a spatial finder? (via Platy Hsu)Browser-based Classic Mac emulatorAbout the Finder...Why bother with a Synology when you can roll your own NAS? (via Dan Zaccaro)This post-show was evaluated as Meets expectations.Sponsored by:Fracture: Photos printed in vivid color directly on glass. Get 10% off your first order.Discourse: Where global teams escape email silos and interruptions. Get 20% off your first 12 months with code ATP2019.Backblaze: Online backup for $5/month. Native. Unlimited. Unthrottled. Uncomplicated. Follow-up:Hosting a podcast for free on Anchor or SoundCloudContacts syncing limitsMojave stabilityPossible T2 Mac audio glitching bugRumor explosion from Ming-Chi Kuo and Mark Gurman16-inch MacBook ProiBook G431.6" 6K3K display with Mini-LED-like backlightApple Mulling Preview of New Modular Mac Pro at WWDC in JuneMarzipan rumorsOverton window#askatp:Could the next Apple TV be wireless? (via Ed Cormany)Is wireless CarPlay a deal-breaker? (via Eddie Lee)How is season 3 of The Grand Tour? (via Paul Walker (not that one))Post-show: Apple ID ManagementTwo factor requirementsSponsored by:BoxySuite: A beautiful suite of Mac apps for Gmail and Google Calendar. Get a 30% lifetime discount on all plans with code atp30.Fracture: Photos printed in vivid color directly on glass. Get a special discount off your first order. Pre-show: Casey is surfing the 'net at lightning speedsMarco's 👂🏻💦Eustachian tubeScott O'ReillySpider StrategiesThe DashApple's security bug bountiesApple compensates FaceTime bug kidSome information on Deirdre O'BrienRyan's tweetBusiness Insider profileApple Joint VentureThe changing role and training of an Apple GeniusSpotify also bought AnchorStratechery & ExponentLibSynJohn on e-booksAmazon buying EeroRing video doorbellEero Plus subscriptionUbiquiti#askatp:How do we feel about buying refurbished tech products? (via David Hadley)Nintendo refurb storeApple refurb storeHow does one move from being a beginner to intermediate programmer, especially with code structure? (via Ryan Bible)NSHipsterWWDC sessionsGravatarWhat size wheels should one get on a new car? (via Nathan Miller)Post-show: j.o.h.n.s.i.r.a.c.u.s.a+somespamservice@gmail.comSponsored by:Linode: Instantly deploy and manage an SSD server in the Linode Cloud. Get a $20 credit with code atp2019.Squarespace: Make your next move. Use code ATP for 10% off your first order.Casper: Get $50 off select mattresses with code ATP. Terms and conditions apply. How do comments here work?